A mod which bring true medieval experience to Skyrim. Supports all DLC and all mods! 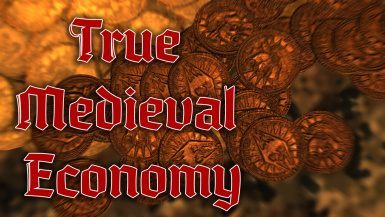 True Medieval Economy is a mod intended to add even more realism and immersion to the world of Skyrim. 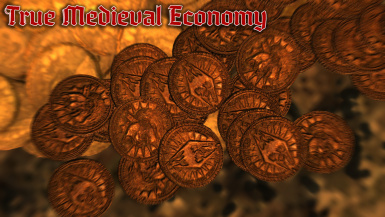 It makes Skyrim's economy as close to the real Middle Ages Europe as possible. I'm not joking - TME's economy is fully based on real Late Medieval England, and bounties (or should I use the word "wergeld"?) are almost directly taken from the Ancient Germanic Law. P.S. And it supports all DLC and many other mods! Note: as there is no SKSE64, a septim in TME SSE is two times more expensive than in TME LE. Everything else is the same. Septim now is a small bronze coin of very little value. Unqualified work is very cheap. Clothes, clutter, books, scrolls, bows and crossbows are expensive. Armors, weapons and horses are very expensive. Same for scrolls and houses. Gems and jewellery are EXTREMELY expensive. Oh, and your wergeld is very high too. So think well before killing someone in front of a guard. 3) if you want to setup your own modifiers, change them in code. Everything here is very self-explanatory and does not require any programming experience. 5) Select one of your mods, press right mouse button and select "Apply script". Choose True Medieval Economy.pas. Press "Apply". 6) When prompted, enter name of new patch file "TME.esp". 7) Wait. Read all the messages! Q: I have errors while generating patch. A: Patch is good, but one of your plugins is not. More information in the sticky post. A: One septim now is equal to the English medieval farthing (1/4 of a penny). You can also think of the smallest Roman coin ("as") during the decay of the Empire. I took medieval prices from my sources and compared them to the vanilla Skyrim prices. This allowed me to calculate some multipliers, and my script will create a patch for all your items with changed prices. Note: these prices are for LE, for SE divide them by 2. A: Food x0.5 if you don't use CACO/x0.25 if you do use CACO, alchemy and ingredients x2.5. Backpacks/bandoliers/knapsack x5, tools x5, ingots/ore x5, clutter x5 and pelts x5. Clothing and Clutter Fixes will also make stuff above more balanced and expensive! Armor x15, melee weapons x10, bows/crossbows x5, arrows and bolts x2. Books x20, scrolls x10, spell tomes and recipes x10. Note: all modifiers can be simply changed inside the script! No programming knowledge required, only notepad. Horse is 10 000, mercenary is 10 000, room rental is 4, all houses are more expensive..
1 hour of woodcutting will earn you 1.5 septims, of mining - 2 (with RP Chopping and mining). If your spouse has a store he/she will earn your from 25 to 50 septims a day. Bosses are much more richer than usual enemies. Wergeld (bounty for murder) now is 15 000 septims, other bounties also higher. Q: Why do I need your little "True Soldiers" mod? A: You don't. But I love it and prices of the light armor are based on the core idea of that mod (that Stormcloaks and guards are wearing actual strong chainmail).